"You shall hang by the neck until you are dead, dead, dead!" The early seasons of Star Trek always seemed rather campy to me. I grew up with The Next Generation, and always found that series to be more adult and intellectual. I always enjoyed the original cast more, however, and loved them in their movies. So, when the episodes began appearing on DVD, I made a dedicated effort to watch them all. I found myself liking the show more and more as it went on. True, the 1960s' feel is a bit much at times, but the core message of the series, and the inventiveness with which it is conveyed, keeps these episodes fresh and entertaining even 35 years after they first aired. Shore Leave is the kind of episode that initially turned me off to the series. The plot is rather goofy in places, and the whole production seems, on the surface, rather absurd. But once I got past those aspects, I discovered a rather compelling sci-fi story, with a neat twist ending. The Enterprise crew is in need of a rest after three hard months in space. McCoy and Sulu lead a survey team on an uncharted planet than seems uncannily like Earth. But strange things soon start to happen. McCoy sees a giant white rabbit, straight out of Alice in Wonderland, with a little blonde girl following behind. Sulu discovers an old-style Western firearm. And a masked bandit attacks Yeoman Angela Martine. Kirk beams down to investigate and starts seeing old flames and old classmates from Starfleet Academy. It appears that their inner fantasies and thoughts are coming true, and some strange power source has left the crewman stranded on the planet. Once you get over the inherent corniness of the fantasy segments (a giant man in a rabbit suit and a medieval princess gown? ), this isn't a bad episode. It actually offers a nice look at the personal lives of the characters. What thoughts are made manifest tells us something about them as people. And while Sulu's interest in Samurai warriors and Kirk's battles with an upper-classman years ago don't reveal earth-shattering personality details, they are amusing all the same. The ending is quite nice as well. Notes: The first episode featuring a fake-out death of a main character. Famous science fiction writer Theodore Sturgeon wrote this episode and also the classic "Amok Time." When Spock imagines the tiger, he also helpfully imagines a chain holding it at bay. The ultra-detailed scan shows no life on the planet, not even insects. Likelihood of a planet with no animal life aside, why can bugs be seen flying around? Spock: I object to you. I object to intellect without discipline. This was one of the first episodes of classic Trek that I watched all the way through, mostly because of similarities to the Q character on The Next Generation. And once again, I had some trouble ignoring the cheap look of it all, and the fact that much of the episode is set in medieval surroundings. But I found myself getting drawn into the story again, and I began to appreciate not so much the look of a particular episode, but the story at its core. The Squire of Gothos is more light-hearted than most classic Trek, and it eschews any sort of symbolic social message, but its very entertaining nonetheless, and a clear example of the winning talent of the original cast. While on a mission to deliver supplies to Colony Beta VI, the Enterprise cuts across an uncharted region of space. The ship encounters an uncharted planet (sensing a theme here? ), and scans the surface, when suddenly, Kirk and Sulu disappear from the bridge! McCoy and various miscellaneous crew members beam down to investigate, and find themselves in an ornate 15th Century style palace. Their host is Trelene (William Campbell), a god-like being with the power to create objects and manipulate time at his will. He is fascinated by the Enterprise and her crew, and toys with Kirk, forcing him to perform several tasks in order to save his crew. This is probably one of the most enjoyable episodes of the first season, and one of the first willing to have a bit of fun—the playful tone stands in stark contrast to more serious earlier episodes. Trelene is an amusing opponent, and the ending, while quite silly, is another amusing surprise. Notes: Trelene is the clear forebear to Star Trek: The Next Generation favorite Q (John de Lancie). There's even a novel, Q Squared, that postulates that Trelene was the illegitimate son of Q. James Doohan provides the voice of Trelene's father. Image Transfer Review: Quality is on par with other volumes in the series. Colors look rich and saturated (especially in Shore Leave, which has a very bright palate), though fleshtones veer towards the red. Special effects shots show quite a bit of film grain, but it isn't a problem in the main body of the show. There is one brief shot of Spock in Shore Leave that looks like it was taken from a poor quality video master, but otherwise, the restoration looks wonderful (good thing this show was shot on film!). Audio Transfer Review: Once again, the series has received a fine 5.1 remix. Directionality is limited, but does add to the flavor of the presentation. Dialogue is clear, and there is no audible soundtrack hiss in the background. The music sounds rather harsh in this volume, however, and the extensive use of the repetitive score in Shore Leave really grates on the nerves—it seems to have been mixed too high, and without low end support. Extras Review: Two TV spot previews for each episode, and that's it. Two above-average episodes make this volume well worth adding to your Trek collection. Just try to ignore the liberal doses of camp. 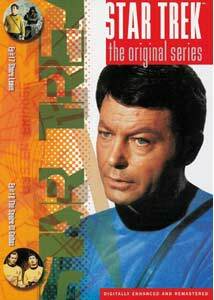 No red shirts were harmed in the reviewing of this DVD.